Our damage recovery team is licensed, insured and highly trained in fire, smoke, water and mold damage restoration. Call 989-386-6994! 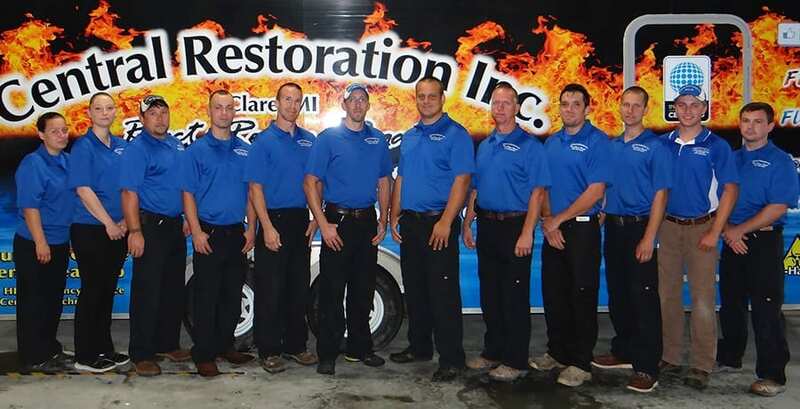 At Central Restorations, serving Clare, MI and surrounding areas, we pride ourselves on being the best at what we do. If it’s worth doing, it’s worth doing right. Cutting corners, improper repairs and cosmetic touch-ups are not things we do. Not only would that be a disservice to you, but it would also not be in accordance with local, state and federal guidelines. We always follow best practices and use only top-of-the-line products. While you understand our specialized services are worth something, you don’t want to be gouged either. We are very competitively priced in our market. You will not get better quality workmanship combined with a compassionate attitude for the price anywhere else. Central Restoration is your single source for residential, commercial and industrial damage restoration and cleanup services. We also offer a full lineup of carpet-cleaning and duct-cleaning services. We use environmentally friendly products and state-of-the-art equipment. We offer a free duct inspection with video and photos of your actual ducts. We are a fully trained and certified lead removal firm. The key to any disaster is an immediate response from professionals who are trained in disaster mitigation and restoration. From comprehensive damage assessment to a thorough cleanup, our experts will accompany you through the restoration process, bill your insurance company and help you get back to normal ASAP. Call us today at 989-386-6994 for an estimate. Hiring a licensed contractor gives you the peace of mind that the job will be done to your specifications, as well as meet all legal specifications required for the job. Licensed contractors can provide you with references, length of time in business, quality and quantity of tools and materials, and even obtain building permits if necessary, as well as any other general services that ensure quality over all else. Our communication with our customers is second to none. You can expect daily updates regarding progress and completion time estimates, as well as any unforeseen problems. Knowing that the process is moving along and being taken care of professionally and according to plan can help ease the worry. We strive to maintain 100 percent customer satisfaction; good communication is just one more way we ensure that happens. We strive to maintain a 100 percent satisfaction rate and strive to do all we can to make such an uncomfortable situation go as smoothly as we can. If you are in need of a bio-hazard cleanup company, you have better things to worry about than if we are doing our job properly, if the pricing is on par and so on. Call a company you can trust. When you call us at 989-386-6994, you will talk to a person – someone who cares about you and your situation; someone who wants to help; most importantly, someone who knows how to help. That’s the kind of service you deserve. HAVE AN EMERGENCY? CALL 989-386-6994 NOW! We are a full service Fire, Water, Wind, Mold and Biohazard restoration company. Fully trained, certified, and insured, we are the best choice in Central Michigan.